CHNC News: More Historic News from Bent County! Thanks to the generous support of our partners, the Las Animas – Bent County Library District and the John W. Rawlings Heritage Center, the Colorado Historic Newspapers Collection now includes 1082 issues of the Las Animas Leader, from 1873 to 1912. The Library District and the Heritage Center partnered together to add 998 issues of the Leader, thereby increasing access to the historic news of Bent County. The Bent County Library District applied for funds from the Bent County Sales and Use Tax. The Bent County Commissioners awarded the district the funds to digitize and add the Leader to CHNC. Las Animas Leader, May 23, 1873. Las Animas City was established in 1869 and by 1873 had 250 residents who were eager for a local paper. 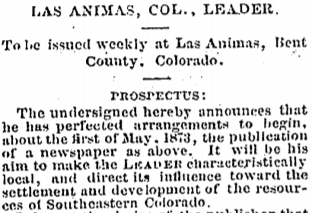 On May 23, 1873, Charles W. Bowman, a newspaperman from Missouri, published the first issue of the Las Animas Leader. The first issues of the Leader enticed new residents to the community by proclaiming its virtues – fertile lands, reasonable land prices, good schools and numerous opportunities for work. The Leader changed hands a number of times and continued to be published until 1964. Currently, this is the only title CHNC has available for Bent County. The Library District and the Heritage Center hope to change that. Digitization of these early years of the Leader is only the start of their long term goal of providing wider public access to Bent County history. They are working to continue the effort of digitizing the Leader and also hope to digitize the Bent County Democrat and the Hasty Herald. This partnership also works towards CHNC’s goal of increasing public access to the historic news of counties that are currently underrepresented in CHNC. With the help of our partners we add new content to CHNC every few months so don’t forget to check back often. If you would like to learn more about becoming a CHNC partner and how to add historic news to CHNC please contact me at ljeremias@coloradovirtuallibrary.org.